The 25-year-old Frisky rapper, who previously high-fived Prince William at the Baftas, is hoping that his royal connections will bring in a blue-blooded crowd. Tinie told the Daily Star: "I'm hoping all the princes come, even baby George at the side of the stage. That would be amazing." The festival, which will this year become a twin-site event with performances in London and Birmingham, has also added Naughty Boy, Labrinth and Sean Paul to the big names on the bill. It is staged over the weekend of July 4-6 at London's Finsbury Park and Birmingham's Perry Park, with previously announced headliners including Outkast, Bruno Mars, Pharrell Williams and Kanye West. 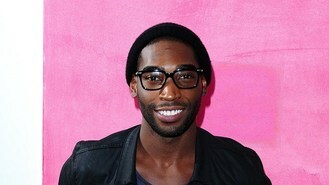 This year would be the fifth performing at the festival for Tinie, whose real name is Patrick Okogwu. "It's the fifth time I've done it. I've been there from the beginning on the smallest stage," he said. "It means a lot and I'll be surrounded by some amazing people in Pharrell and Kanye, my two style icons and inspirations." Tickets for Wireless are on sale now from www.wirelessfestival.co.uk.